In 2010 Russia has progressed in modernization program of surface warships of main classes, landing ships, and auxiliary vessels. Already launched major programs as well as prospective projects approved in 2010 are stated below. Technical design of a Russian aircraft carrier will be developed till the current year is over. When certain favorable conditions occur, first carrier might be launched by 2020. As for Navy Commander-in-Chief Vladimir Vysotsky, this needs a special purpose-oriented program. On this subject we speak only about plans for the future. In 2012 Sevmash shipyard will kick off modernization of Northern Fleet's medium-size aircraft carrier (heavy aircraft-carrying cruiser) Admiral Flota Sovetskogo Soyuza Kuznetsov. The upgraded ship will be launched in 2017. Modernization program implies total replacement of weapons and radioelectronics. The carrier's air group is expected to be increased, too. Presently, the ship is capable to accommodate 26 deck-based fighters Su-33 and MiG-29K, and 24 antisubmarine helicopters – eighteen Ka-27 or Ka-29, two Ka-27PS and four Ka-31. In the course of modernization, the carrier will be armed with shipborne version of SAM system Pantsir. All currently laid up Orlan class nuclear-powered missile cruisers (Project 11442) will be re-commissioned into the Navy till 2020. Cruisers Admiral Nakhimov, Admiral Lazarev, and Admiral Ushakov will join Russian Navy again after modernization within 10 years. Upgraded like Petr Veliky, those ships will constitute the core of Russian Navy. Russia has started development of a new generation destroyer. It is planned to complete project design of the stealth ship within the next 30 months. That is going to be a multipurpose destroyer armed with advanced missile and artillery weapon systems. In April 2010 Severnaya Verf shipyard completed modernization of Project 1155 destroyer Vice Admiral Kulakov. Lead ship if the project had undergone general modernization and started sea trials in mid-April. Modernization works included replacement of arms systems and life support systems. Presently, Russian Navy has seven Project 1155 destroyers in inventory, including Admiral Tributs, Marshal Shaposhnikov, Severomorsk, Admiral Levchenko, Admiral Vinogradov, Admiral Kharlamov, Admiral Panteleev, and one destroyer build under upgraded project 11551 – Admiral Chabanenko. Besides, there are 7 destroyers built under Project 956 Sarych – Burnyi, Bystryi, Bezboyaznennyi, Bezuderzhnyi, Bespokoinyi, Nastoichivyi, and Besstrashnyi. In October 2010 Severnaya Verf shipyard will launch the lead ship of Project 22350 frigate Admiral Flota Sovetskogo Soyuza Gorshkov which will be commissioned in 2011. The first serial frigate of the project – Admiral Flota Kasatonov – is under construction at Severnaya Verf. 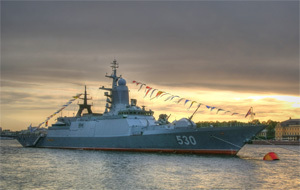 The frigate is planned to join Russian Navy in 2012. First serial corvette of Project 20380 – Soobrazitelny – was launched on March 31 at Severnaya Verf. Lead ship of this project, corvette Stereguschiy was commissioned into Baltic Fleet in October 2008. Navy command appraises the need of corvette class ships as 30. Soobrazitelny is the first serial ship of the project and was built just in time specified by the orderer. Three other corvettes of this project are in various stages of completeness at Severnaya Verf shipyard – Storozhevoi, Boiky, and Stoiky. 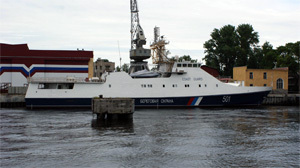 Sea trials of corvette Soobrazitelny are scheduled in October-December 2010. According to Kommersant, soon Russian defense ministry will issue a tender for a project of new prospective corvette which will shift Project 20380 corvettes. Lead missile boat of Project 21631 with displacement of 949 tons was laid down at Zelenodolsk Shipyard on August 27; the boat was named Grad Sviyazhsk. This boat is a modification of Project 21630 Buyan gun boat. In contrast to Buyan, new boat will be armed with missile weapons. The shipyard won the defense ministry's tender and late May 2010 tied a contract for construction of five Project 21631 vessels. The boat's length is 74.1 meters; beam is 11 meters; displacement is 949 tons; max speed is 25 knots. Main purpose is defense and protection of national economic zone. Lead boat of a new Project 22460 Rubin was delivered to Russian FSB Frontier Service in May. The flag-hoisting ceremony was held at Almaz Shipyard (St. Petersburg). The boat will be deployed in the Black Sea. Alongside with delivery of the lead boat, the keel-laying ceremony of the second vessel (first serial) was also held at the shipyard; it must be delivered to the orderer in 2011. Totally, Russian FSB Frontier Service will receive 25 patrol boats of Project 22460 till 2020. Alekseyev Design Bureau (Nizhny Novgorod) specialized in hydrofoil vessels holds negotiations with Rosoboronexport about construction of four fast-speed boats. Air-cushion landing boat Serna is designed for transportation and debarkation of wheeled and tracked vehicles and fully outfit personnel on an unequipped coast. The boat is capable to carry 92 marines, and up to 45 tons of cargo. This September Yantar shipyard (Kaliningrad) started construction of the second ship of Project 11711. Lead ship of this project – large landing ship Ivan Gren – was laid down in 2004. Presently, the ship's hull is completed; basic equipment is being prepared for loading. Keel-laying of Project 22010 Kruis oceanographic ship was held at Yantar shipyard on July 8 under Russian Navy's order. The ship was named Yantar. The contract for building of this ship was signed in February 2009. The vessel's displacement is 5,200 tons; length is 108.1 meters; beam is 17.2 meters. Delivery date is mid-2013. Yantar shipyard also builds Project 11982 research vessel Seliger for the defense ministry. 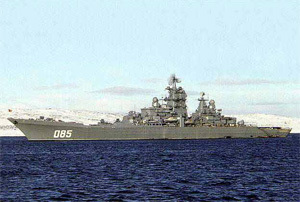 The ship is supposed to join Russian Navy in June 2011. Zvezdochka Ship Repair Center (Severodvinsk) will deliver arms transport ship Zvezdochka to Russian Navy till the current year is over. The ship was laid down in 2004. At present, Severnaya Verf shipyard builds a special communications vessel for the Navy. Construction of a naval base in Novorossiysk will cost RUR 92 bln. As for now, RUR 13.5 bln has been already appropriated for the construction which is to be completed in 2020. All deep-sea works will be finished in 2011. Currently, Russia has only one naval base abroad – Tartous, Syria. At first, Tartous will be developed as a basing site, and then it will become a full-fledged Russian Navy's base. The first phase of development and modernization will be completed in 2012. The Tartous base modernization program implies capability to accommodate large-size ships.